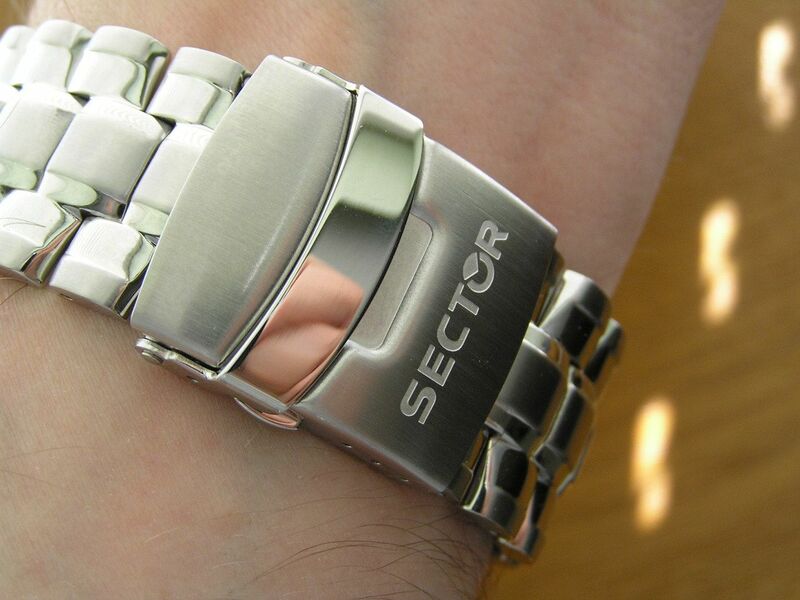 I’ve always been partial to Sector watches because I think they make some great designs, are well made and can represent a good value when purchased at the right price. My very first ‘high-end’ (at least to me, at the time) watch purchase was a Sector SGE-650 Business Time that I bought from Bernard Watch way back in 1996. Since then, I have owned about six different Sector models and with this latest acquisition, currently own two. 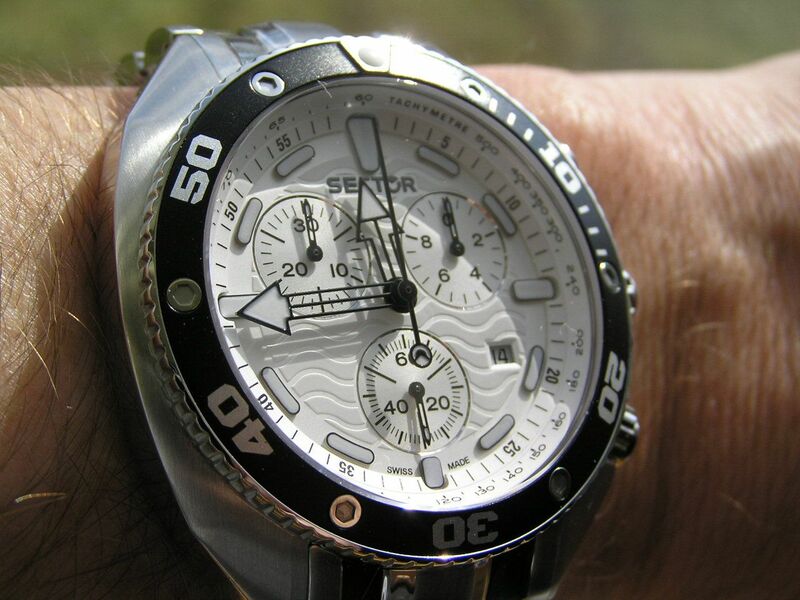 This Sector Ocean Master Chronograph is a Swiss quartz chrono that came in under my $200 self-imposed upper limit for a quartz watch. Ocean Master chronos are available in the white dial reviewed here, as well as black dial with orange bezel, blue dial/blue bezel, black dial/silver bezel, all black IP case with black dial and stainless steel bracelet or rubber strap options. 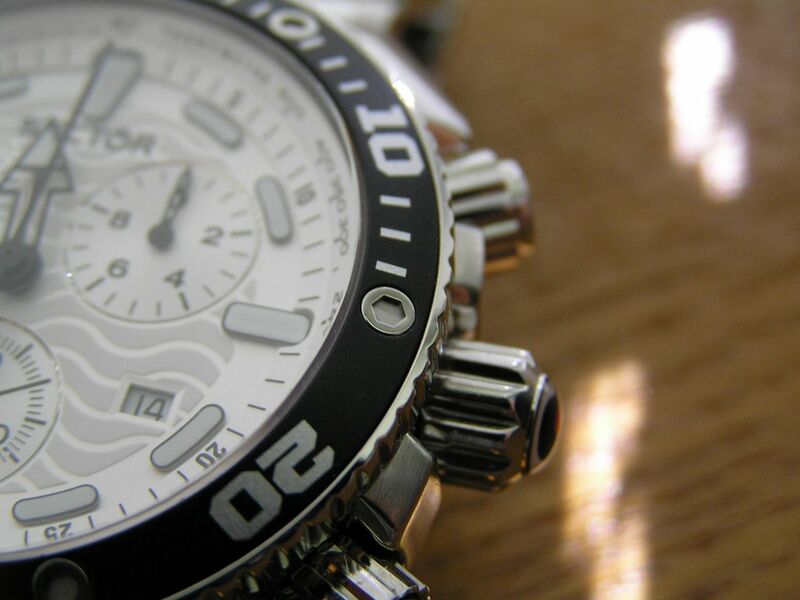 I’m also partial to white dials and this watch fills the bill perfectly. 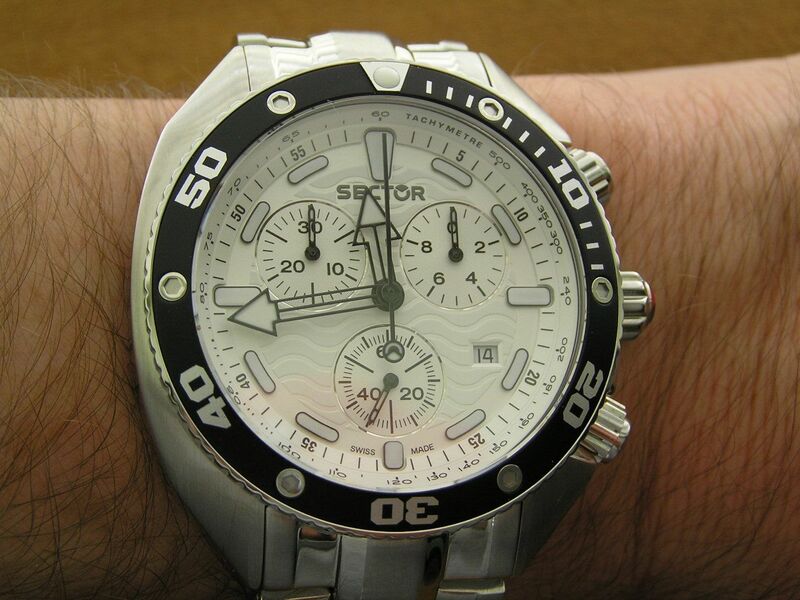 It is a pure white dial, not silvery like some white dials portend to be. 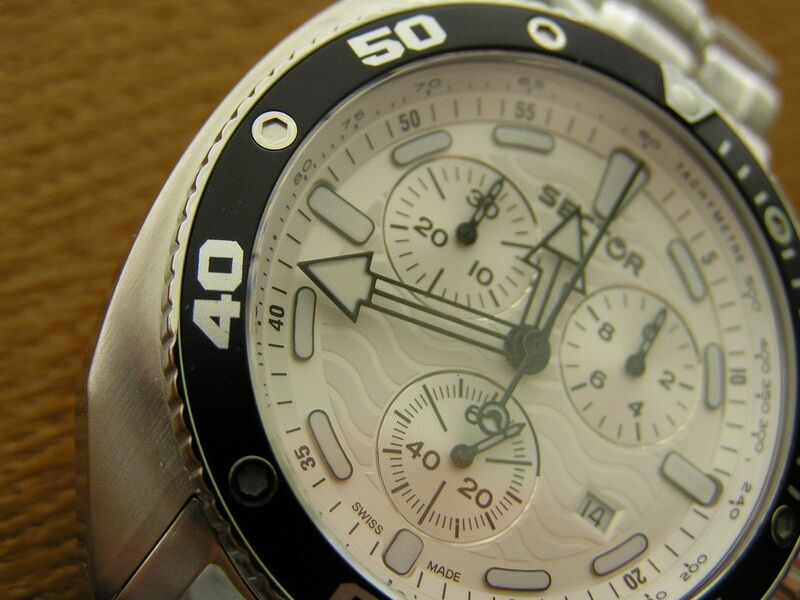 The contrast between the black hands and the white dial is striking and aids legibility. The Ocean Master chrono has what I call a modified cushion case shape, being a bit more angular at the spots where a cushion case would be rounded, but the spirit of the cushion design is present and it looks superb. The case is all stainless steel with polished sides and a brushed top. 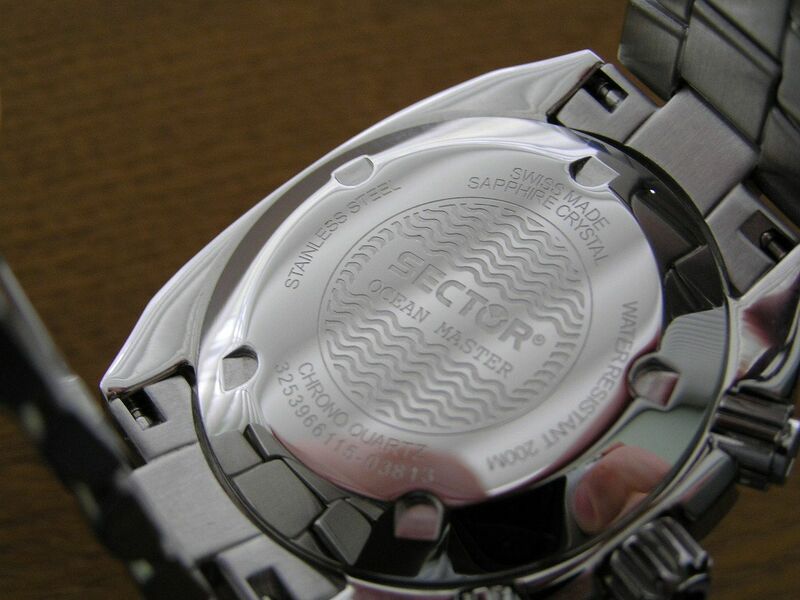 A screwdown polished caseback with the ‘Ocean Master’ wording seals this watch to a 200 meter water resistance rating. 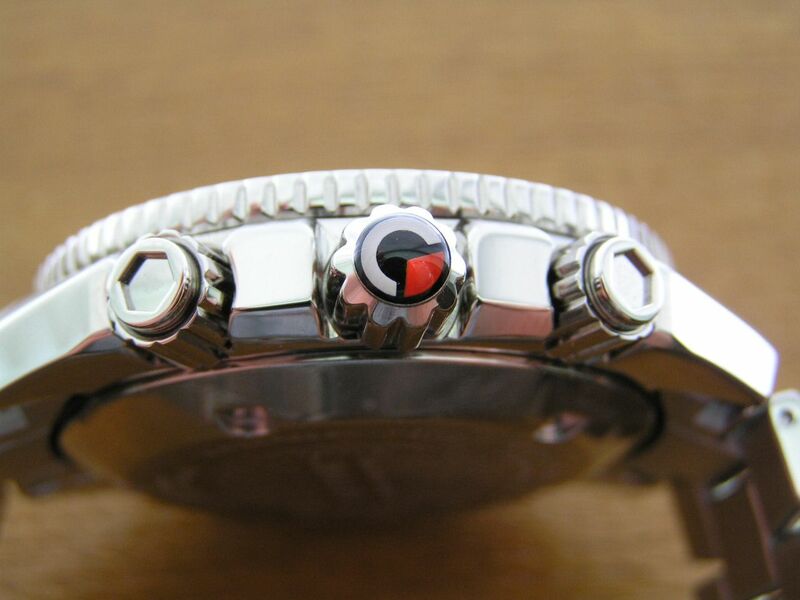 The case measures 44.5 mm without the signed screwdown crown. Thickness is 13.9mm, lug width is an odd 23mm. Fit and finish on this watch is very nice. Sector carries the hex head accents over to the chrono pushers, emblazoning each pusher tip with a hex head design that actually gives a nice tactile feel to the pusher. The pushers screw down as well. The crown, as previously mentioned, is signed (with a colored plastic Sector logo). The crown is about the perfect size, not too large or too small, but has nice deep fluting on it that really gives a good feel when using it to set the time or when screwing it back down. 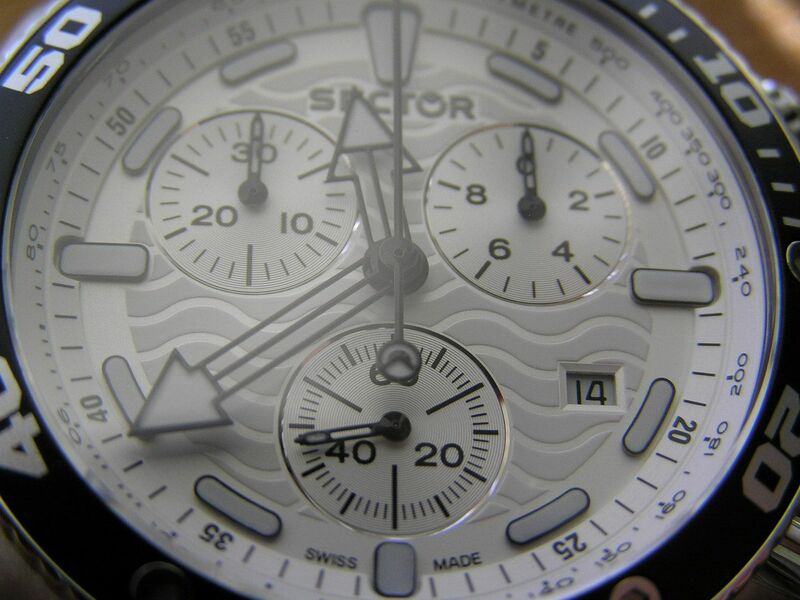 The dial is white, with a wave pattern running across it. 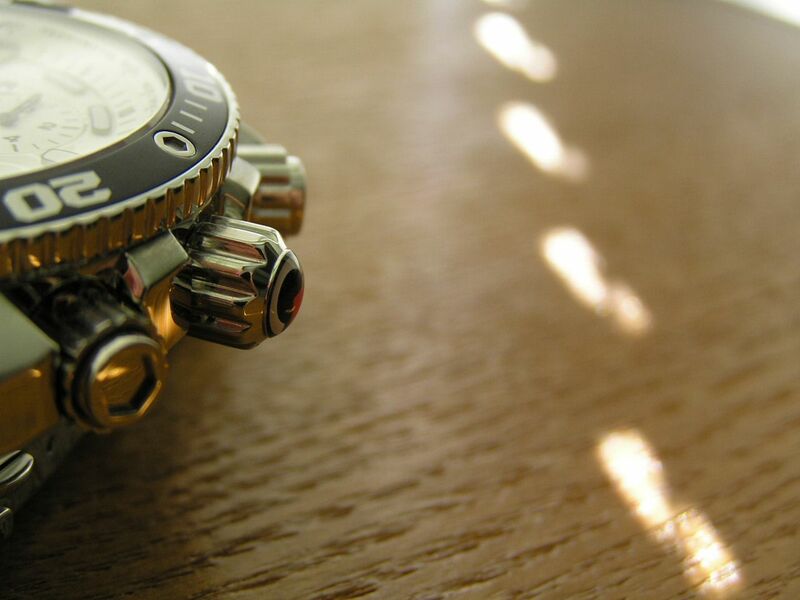 A subtle tachymeter chapter ring encircles the dial. The subdials are circular patterned and slightly inset into the dial and rimmed with a polished silver circle. The applied luminous markers are set at a horizontal position instead of the expected vertical orientation, which again, gives this watch added panache. The hands are black skeleton style with luminous arrow tips. 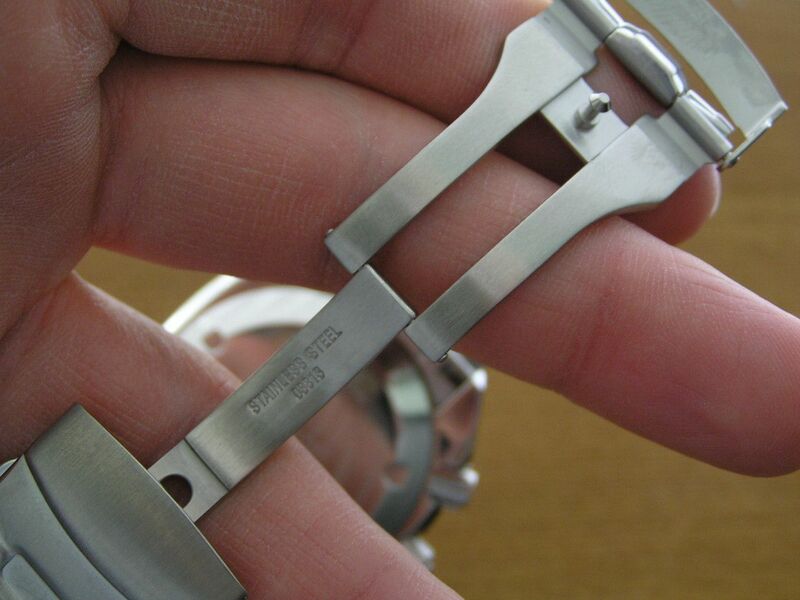 The subdial hands are small skeleton style with lumed tips. 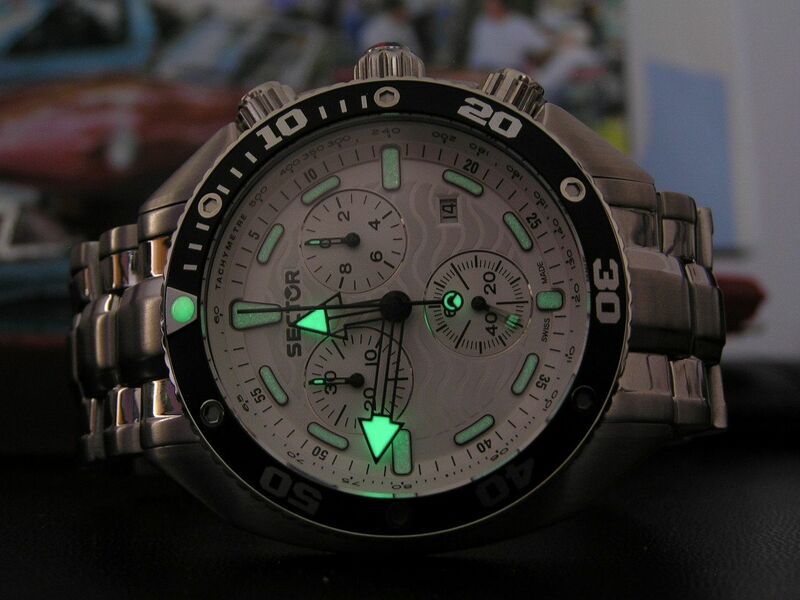 The chrono second hand is all black with a lume tail piece showing the Sector logo. While I’m usually not a fan of skeleton hands, these work well for me and are easily read against the white dial. A quickset date window is at the 4 o’clock position. Lume is nice and bright on the arrow hands and acceptable on the markers. Sector is one of the only makers I know that lumes the hands on their subdials, so you get tiny lumed glows emanating from each subdial. I don’t know how practical this is, but it does look kind of neat. A flat sapphire crystal caps the dial and has no distortion or imperfections. Studying the dial with an 8X loupe revealed no imperfections or faults on the dial or hands. 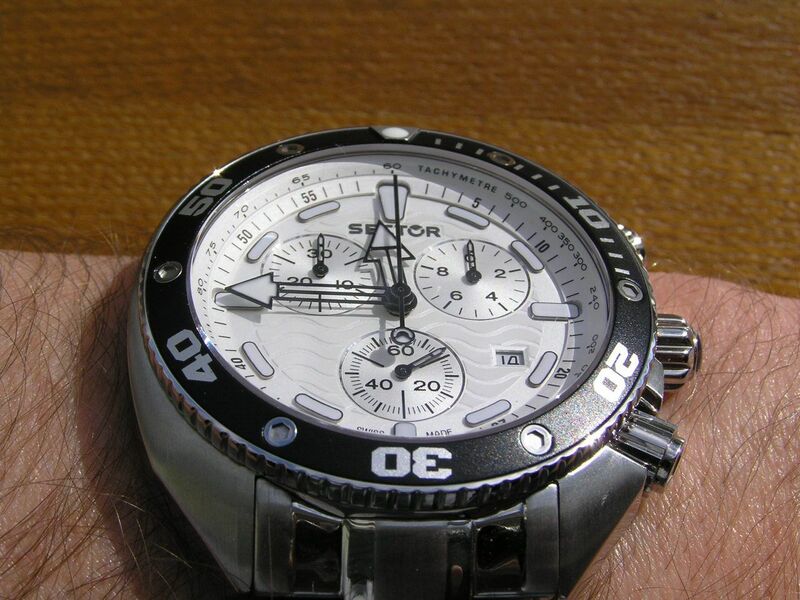 The chrono measures up to 30 minutes in 1/10th second increments with no lap timing capability. The subdial @ 2 is the tenths counter (remains stationary until the chrono is stopped, then displays the tenth of a second reading); the subdial @ 10 is the chrono 30 minute totalizer while the subdial @ 6 is the main watch seconds hand. 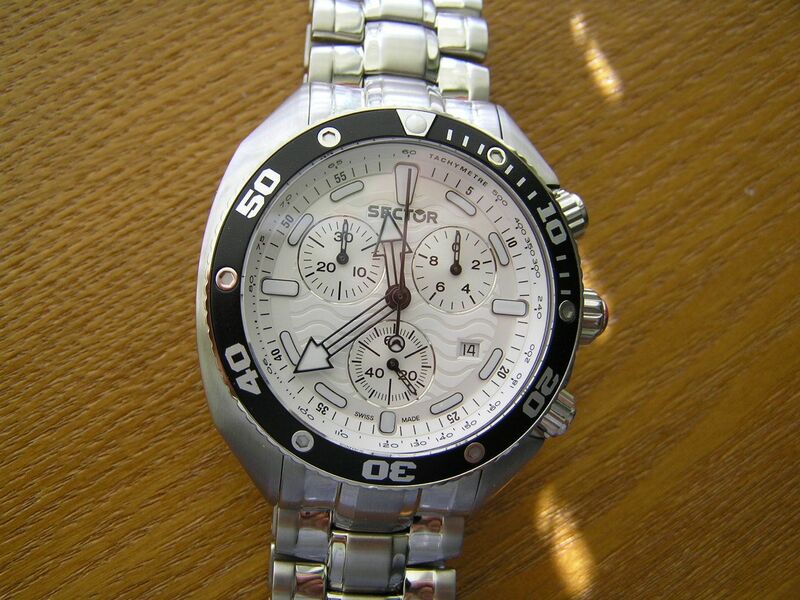 This watch has a Swiss movement in it, presumably an ETA because that is what Sector uses in my other quartz chrono from them. The only difference is that this movement quicksets the date in standard fashion, as opposed to the other ETA movement where you rotate the hour hand independently through a 24-hour cycle to change the date. I won’t know for sure who the maker is until the battery dies, so check back in a couple of years! Timekeeping has been outstanding, over the past 72 hours, it has not gained or lost any time. The chrono action is smooth and the reset works as it should. 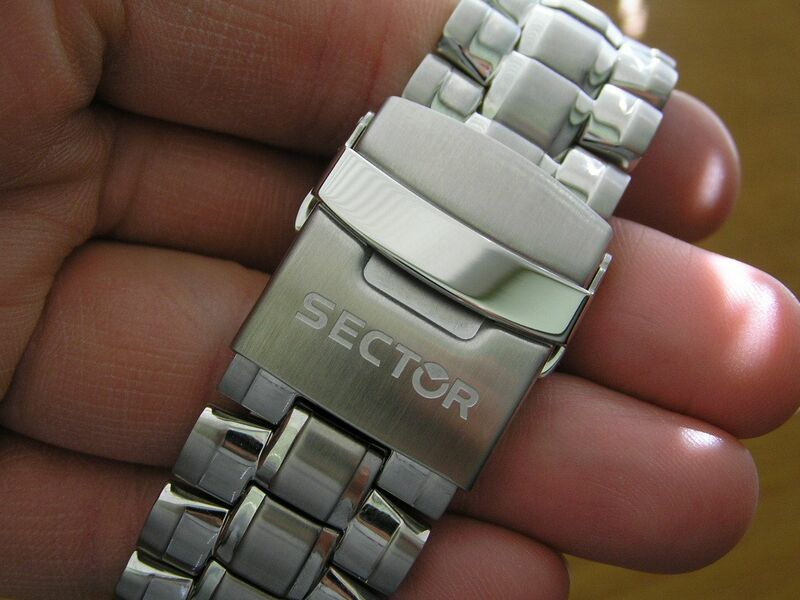 Sector always does a nice job on their bracelets and this one for the most part does not disappoint. The links are solid and are alternately polished and brushed across the face of each link. The link shape and texturing is also intriguing. 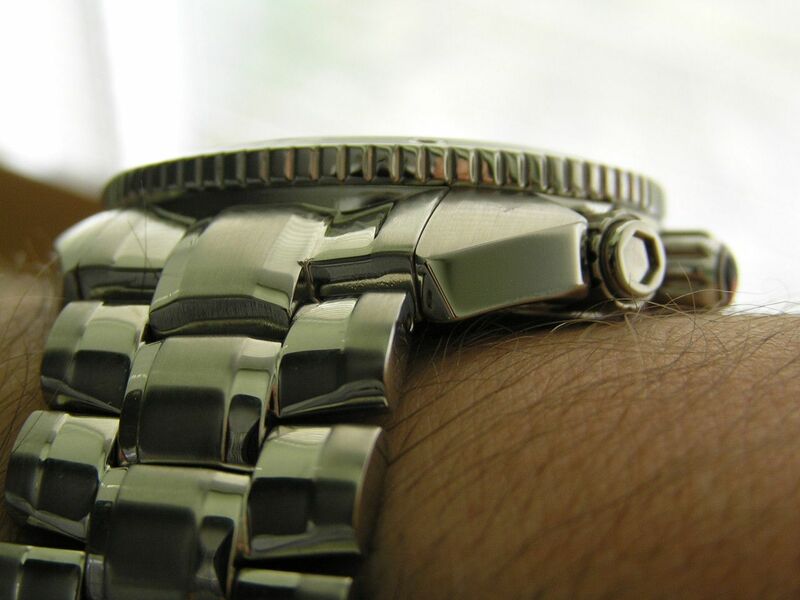 I do wish that each link was a multi-piece design, as this would add more elegance to the watch. As it stands, each link is one piece of stainless steel, albeit nicely finished. 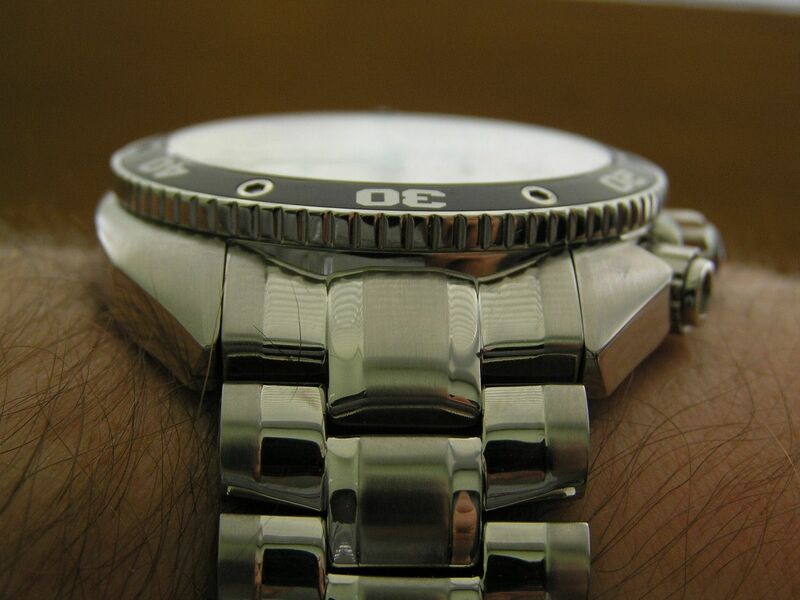 Links measure 23mm wide from the watch head to the clasp. 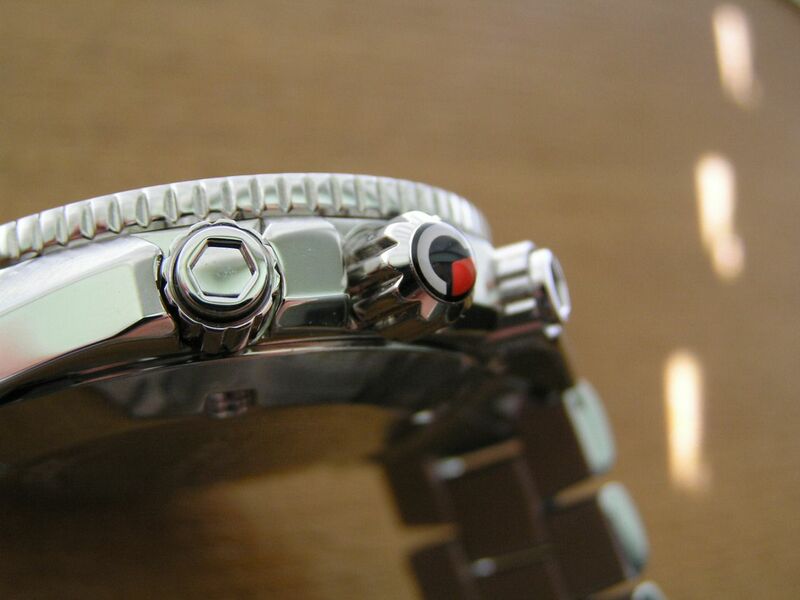 Solid end links, a signed pushbutton double locking clasp and a nice hefty machined deployant complete the bracelet. Links are secured by standard split pins. Presentation is typical Sector, a gloss cardboard outer box and a rubberized and stylized plastic inner box with dense foam inserts. Works for me. While some of Sector’s designs may not be for everybody, the Ocean Master is a functional, attractive and well built piece that has enough of its own personality to stand easily on its own in a sea of look-alike designs. Buy this one at around the $200 mark and you’ve done well and will be rewarded with a watch that looks great, works great and will make you a man for all seasons. 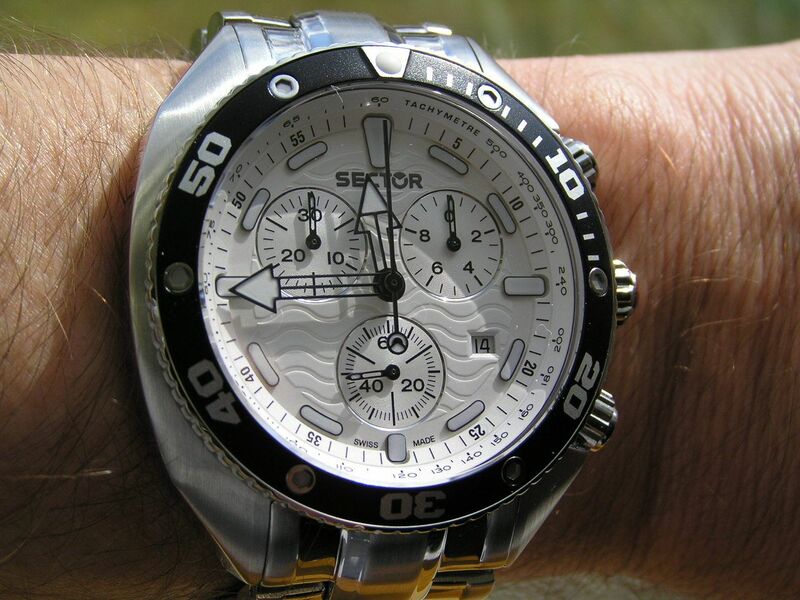 Verdict: Sector did just about everything right with the Ocean Master and presents a solid value in a Swiss quartz chrono with stunning good looks and the goods to back it up. I have owned this watch for six months now and I really enjoy wearing it. 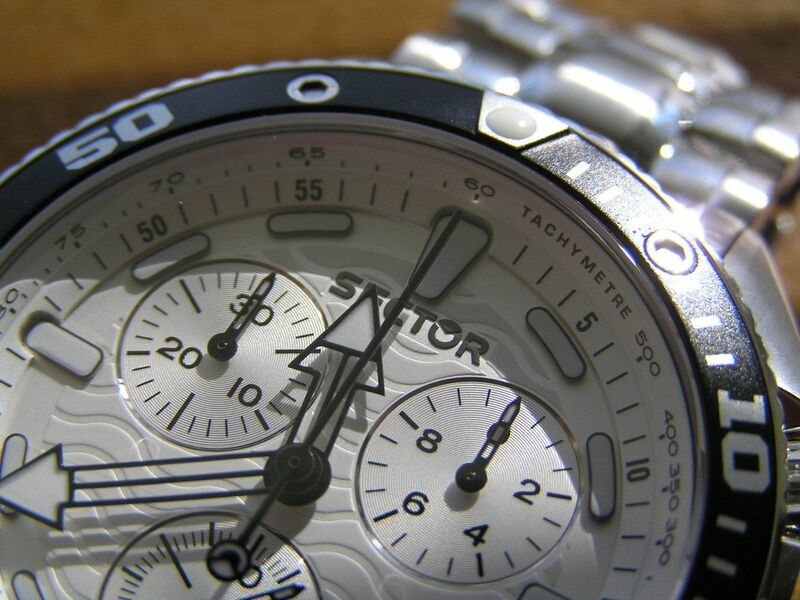 The dial is very legible and it has a real quality look to it. Timekeeping is still excellent, running about one second per week fast. Sector continues to impress me.